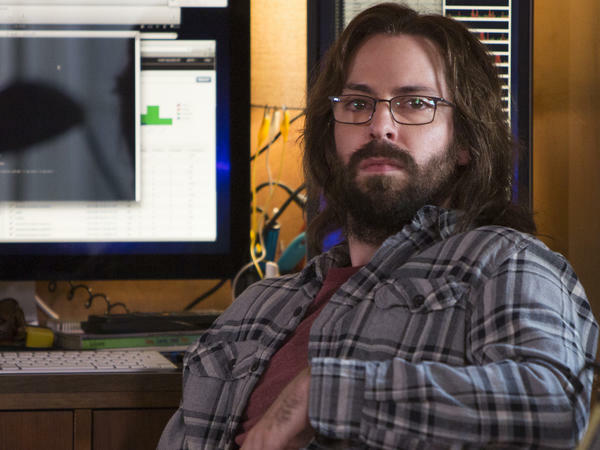 Martin Starr plays software designer Gilfoyle in the HBO comedy Silicon Valley. In the show's new season, Gilfoyle and his fellow techies attend a startup competition named "Disrupt." HBO's Silicon Valley is back, with its pitch-perfect renderings of the culture and language of the tech world — like at the opening of the "Disrupt" startup competition run by the Tech Crunch website at the end of last season. "We're making the world a better place through scalable fault-tolerant distributed databases" — the show's writers didn't have to exercise their imagination much to come up with those little arias of geeky self-puffery, or with the name Disrupt, which, as it happens, is what the Tech Crunch conferences are actually called. As is most everything else these days. "Disrupt" and "disruptive" are ubiquitous in the names of conferences, websites, business school degree programs and business book best-sellers. The words pop up in more than 500 TED Talks: "How to Avoid Disruption in Business and in Life," "Embracing Disruption," "Disrupting Higher Education," "Disrupt Yourself." It transcends being a mere buzzword. As the philosopher Jeremy Bentham said two centuries ago, there is a point where jargon becomes a species of the sublime. To give "disruptive" its due, it actually started its life with some meat on its bones. It was popularized in a 1997 book by Clayton Christensen of the Harvard Business School. According to Christensen, the reason why established companies fail isn't that they don't keep up with new technologies, but that their business models are disrupted by scrappy, bottom-fishing startups that turn out stripped-down versions of existing products at prices the established companies can't afford to match. That's what created an entry point for "disruptive innovations" like the Model T Ford, Craigslist classifieds, Skype and no-frills airlines. Christensen makes a nice point. Sometimes you can get the world to beat a path to your door by building a crappier mousetrap, too, if you price it right. Some scholars have raised questions about that theory, but it isn't the details of the story that have put "disruptive" on everybody's lips; it's the word itself. Buzzwords feed off their emotional resonances, not their ideas. And for pure resonance, "disruptive" is hard to beat. It's a word with deep roots. I suspect I first encountered it when my parents read me the note that the teacher pinned to my sweater when I was sent home from kindergarten. Or maybe it reminds you of the unruly kid who was always pushing over the juice table. One way or another, the word evokes obstreperous rowdies, the impatient people who are always breaking stuff. It says something that "disrupt" is from the Latin for "shatter." Disrupt or be disrupted. The consultants and business book writers have proclaimed that as the chronic condition of the age, and everybody is clambering to be classed among the disruptors rather than the disruptees. The lists of disruptive companies in the business media include not just Amazon and Uber but also Procter and Gamble and General Motors. What company nowadays wouldn't claim to be making waves? It's the same with that phrase "disruptive technologies." That might be robotics or next-generation genomics, sure. But CNBC also touts the disruptive potential of an iPhone case that converts to a video game joystick. These days, people just use "disruptive" to mean shaking things up, though unlike my kindergarten teacher, they always infuse a note of approval. As those Tech Crunch competitors assured us, disruption makes the world a better place. Taco Bell has created a position called "Resident Disruptor," and not to be outdone, McDonald's is running radio ads describing its milkshake blenders as a disruptive technology. Well, OK, blenders really do shake things up. But by the time a tech buzzword has been embraced by the fast food chains, it's getting a little frayed at the edges. "Disruption" was never really a new idea in the first place, just a new name for a fact of life as old as capitalism. Seventy years ago the economist Joseph Schumpeter was calling it the "gales of creative destruction," and he just took the idea from Karl Marx. The wonder is that "disruptive" is still clinging to life out there. There's a market in language, too, and jargon starts to lose its market share when its air of novelty fades. "Thought leader," "change agent" and "disruption," too — as the words get stale, they're in line to be disrupted themselves by scrappy new buzzwords that can once again convey an illusion of fresh thinking. That's why jargon always has to replenish itself, the same way slang does — though like slang, it takes a while to work its way from the cool kids' table to the outskirts of the lunchroom. It wouldn't be surprising if some people are still saying "disruptive" a decade or two from now. After all, there are still people saying "far out" and wearing those big 1970s eyeglasses, too. The only difference is that slang owns up to being no more than a matter of fashion, while jargon always has to pretend that it's something else. This is FRESH AIR. The return of the HBO series "Silicon Valley" has our linguist, Geoff Nunberg, thinking about the language techies use, particularly the buzzword disrupt. GEOFF NUNBERG, BYLINE: HBO's "Silicon Valley" is back with its pitch-perfect renderings of the culture and language of the tech world like the opening of startup competition run by the TechCrunch website at the end of last season. JASON KINCAID: (As himself) People, are you ready? Are you ready for the ultimate tech startup competition? Let me hear it - disrupt. BOBAK BAKHTIARI: (As Immedibug CEO) Hello. My name is Sayid Jibrani (ph). I am the CEO of Immedibug, and we're here to revolutionize the way you report bugs on your mobile platform. BRANDON HIGA: (As HAPPIN! CEO) HAPPIN! will revolutionize location-based mobile news aggregation as you know it. EFRAIN GOMEZ: (As Systobase CEO) We're making the world a better place through Paxos algorithms for consensus protocols. ISAAC CHEUNG: (As BitFlenser CEO) And we're making the world a better place through software-defying data centers for cloud computing. SHAINU BALA: (As Yoga Master CEO) A better place through canonical data models to communicate between endpoints. BOBO CHANG: (As Flingual CEO) A better place through scalable, fault-tolerant, distributed databases with ACID transactions. BALA: (As Yoga Master CEO) And we are truly local, mobile social. GOMEZ: (As Systobase CEO) And we're completely so-mo-lo. MATT HOUSTON: (As d-keen CEO) And we're mo-lo-so. NUNBERG: The show's writers didn't have to exercise their imagination much to come with those little arias of geeky self puffery. Disrupt, for example - that's what the TechCrunch conferences are actually called as is most everything else these days. Disrupt and disruptive are ubiquitous in the names of conferences, websites, business school degree programs, business book bestsellers and companies new and old. The words pop up in more than 500 TED Talks - "How to Avoid Disruption in Business and in Life," "Embracing Disruption," "Disrupting Higher Education," "Disrupt Yourself." Disruptive transcends being a mere buzzword. As the philosopher Jeremy Bentham said two centuries ago, there's a point where jargon becomes a species of the sublime. To give disruptive it's due, it actually started its life with some meat on its bones. It was popularized in a 1997 book by Clayton Christensen of the Harvard Business School. According to Christensen, the reason why established companies fail isn't that they don't keep up with new technologies but that their business models are disrupted by scrappy bottom-fishing startups who turn out stripped-down versions of existing products at prices the established companies can't afford to match. That's what created an entry point for disruptive innovations like the Model T Ford, Craigslist classifieds, Skype and no-frills airlines. Christensen makes a nice point. Sometimes you can get the world to beat a path to your door by building a crappier mousetrap, too, if you price it right. Some scholars have raised questions about that theory, but it isn't the details of the story that have put disruptive on everyone's lips. It's the word itself. Buzzwords feed off their emotional resonances, not their ideas. And for pure resonance, disruptive is hard to beat. It's a word with deep roots. I suspect I first encountered it when my parents read me the note that the teacher pinned to my sweater when I was sent home early from kindergarten. Or maybe it reminds you of the unruly kid who was always pushing over the juice table. One way or another, the word evokes obstreperous rowdies, the impatient people who are always breaking stuff. It says something that disrupt is from the Latin for shatter. Disrupt or be disrupted. The consultants and business book writers have proclaimed that as the chronic condition of the age, and everybody is clambering to be classed among the disruptors rather than the disruptees. The lists of disruptive companies in the business magazines include not just Amazon and Uber, but also Procter & Gamble and General Motors. What company nowadays wouldn't claim to be making waves? It's the same with that phrase, disruptive technologies. That might be robotics or next-generation genomics, sure, but CNBC also touts the disruptive potential of an iPhone case that converts to a videogame joystick. By now, people just use disruptive to mean shaking things up, though unlike my kindergarten teacher, it's always with a note of approval. As those TechCrunch competitors assured us, disruption makes the world a better place. Taco Bell has created a position called chief disruptor. And not to be outdone, McDonald's is running radio ads describing its milkshake blenders as a disruptive technology. Well, OK, blenders really do shake things up, but by the time a tech buzzword's been embraced by the fast food chains, it's getting a little frayed at the edges. Disruption was never really a new idea in the first place, just a new name for a fact of life as old as capitalism. Seventy years ago, the economist Joseph Schumpeter was calling it the gales of creative destruction, and he just took the idea from Marx. The wonder is that disruptive is still clinging to life out there. There's a market in language, too, and jargon starts to lose its market share when it's air of novelty fades. Thought leader, change agent and disruption, too - as the words get stale, they're in line to be disrupted themselves by scrappy new buzzwords that can once again convey an illusion of fresh thinking. That's why jargon always has to replenish itself the same way slang does. Though, like slang, it takes a while for the new words to work their way from the cool kids' table to the outskirts of the lunch room. It wouldn't be surprising if some people are still saying disruptive a decade or two from now. After all, there are still people saying far out and wearing those big 1970s eyeglasses, too. The only difference is that slang owns up to being no more than a matter of fashion, while jargon always has to pretend that its something else. GROSS: Jeff Nunberg is a linguist who teaches at the University of California Berkeley School of Information. Transcript provided by NPR, Copyright NPR.